Kristian Baker received her Ph.D. in Genetics from the University of British Columbia (UBC) in Vancouver, Canada in 2002. She completed post-doctoral training at the Howard Hughes Medical Institute at the University of Arizona under the mentorship of Dr. Roy Parker, a pioneer in the study of RNA regulation and metabolism. 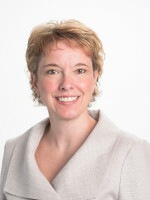 She joined the faculty at Case Western Reserve University in 2005 and is currently a tenured Associate Professor in the Department of Genetics & Genome Sciences where her lab investigates molecular mechanisms that regulate the interplay between mRNA translation and degradation, and how RNA quality control is maintained in the cell. Outside of the lab, she is an engaged mentor and enthusiastic educator, and serves the greater RNA scientific community as Chair of the Membership Committee for the international RNA Society. Nonsense-mediated mRNA decay (NMD) denotes the remarkable cellular surveillance system in eukaryotic cells that recognizes and eliminates mRNA encoding nonsense codons within their protein-coding region (Figure 1). Nonsense codons direct premature termination of translation and, as a consequence, the synthesis of incomplete polypeptides. The prompt degradation of nonsense-containing mRNA by the NMD pathway assures that the mRNA does not accumulate as a substrate for translation, thereby protecting cells from amassing truncated polypeptides that might confer deleterious dominant-negative or gain-of-function phenotypes to the cell. The NMD pathway represents a conserved and essential biological process necessary for protecting cells from transmitting faulty genetic information. In spite of almost three decades of study, a number of fundamental questions central to this process remain poorly resolved, including how cells discriminate between normal and premature translation termination and what molecular events occur subsequently to cause accelerated decay of the nonsense codon-containing mRNA. The Baker lab uses molecular, biochemical, and genetic approaches to study the underlying mechanisms of NMD, with the ultimate goal of developing therapeutics which could modulate NMD and be applied for the treatment of patients with a vast array of genetic diseases caused by nonsense mutations. Purification of Transcript-Specific mRNP Complexes Formed In Vivo from Saccharomyces cerevisiae. ATP hydrolysis by UPF1 is required for efficient translation termination at premature stop codons. Nonsense-mediated RNA decay--a switch and dial for regulating gene expression. Codon optimality is a major determinant of mRNA stability. 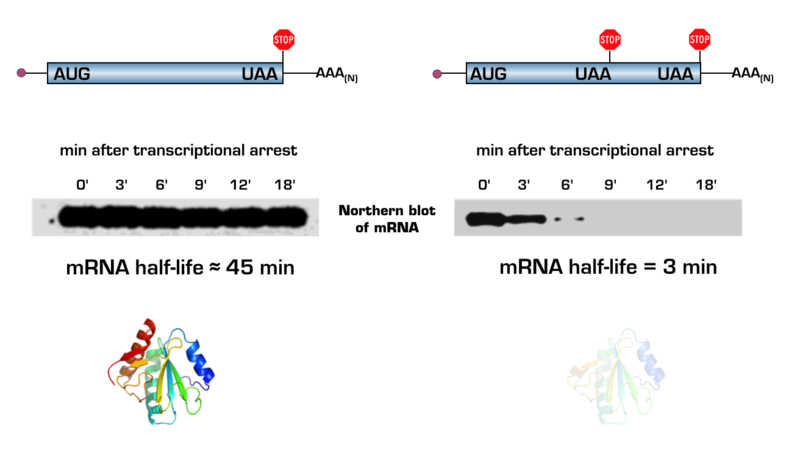 Decapping of long noncoding RNAs regulates inducible genes. Nonsense-mediated mRNA decapping occurs on polyribosomes in Saccharomyces cerevisiae. Co-translational mRNA decay in Saccharomyces cerevisiae. Nonsense-mediated mRNA decay in yeast does not require PAB1 or a poly(A) tail. Conventional 3' end formation is not required for NMD substrate recognition in Saccharomyces cerevisiae. Under the Tucson sun: a meeting in the desert on mRNA decay. Nonsense-mediated mRNA decay: terminating erroneous gene expression.